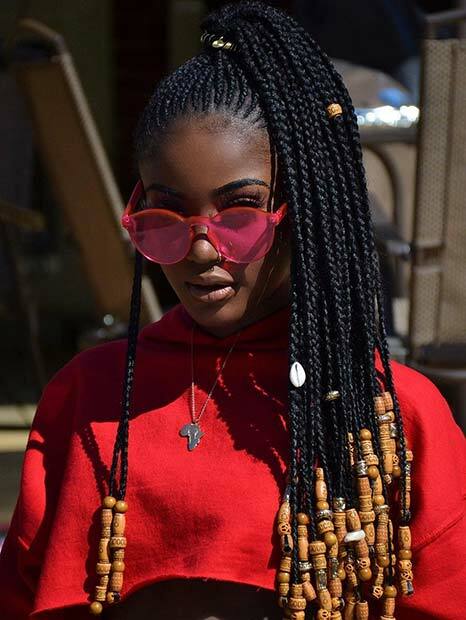 You can create so many amazing designs by using braids in different thicknesses. Here we have a braided ponytail that features chunky braids with thin ones in-between. The combination creates a unique and stylish pattern. This is a beautiful hairstyle that would look stunning on anyone. Our next idea is a very high ponytail that features a trendy but subtle pattern and braid cuffs. We love the small pattern that has been designed at the back because it is stylish but is not too over the top. It is perfect for someone who wants a pattern without being too bold. You can recreate a similar style or choose the ponytail without the pattern or braid cuffs. It is not just beads and cuffs you can accessorize your ponytail with. You can also use other things like pretty shells. 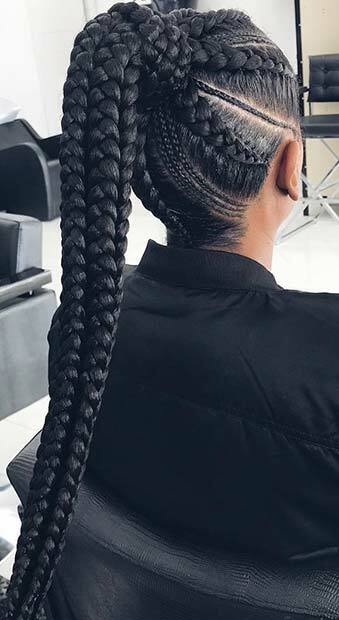 This braided ponytail features just one shell at the front. The use of the shell creates a stylish, creative and stunning hairstyle that will wow. You can use one shell like this or maybe add a few more. Either way, it will look gorgeous. You can make your braided ponytail unique by adding beads. Beads can be bought in any shape and color so the possible looks you can create are endless. This ponytail features lots of wooden beads with the addition of a shell. Recreate a similar look or choose more vibrant beads. Next, we have another long braided ponytail but this one shows another way you can style it. This one features a braid cord and uses thicker braids. We love this ponytail! It will wow everyone and give them hair envy. You can use any color cord and create any pattern. 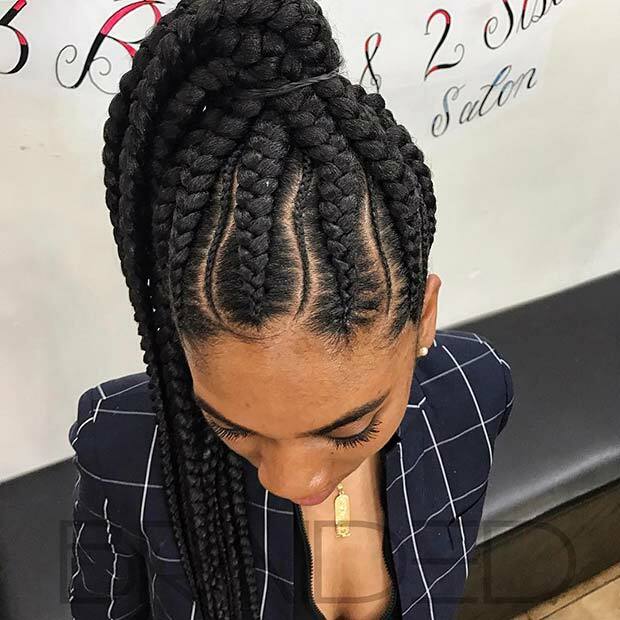 Give your braids a unique look by creating an intricate design like featured. 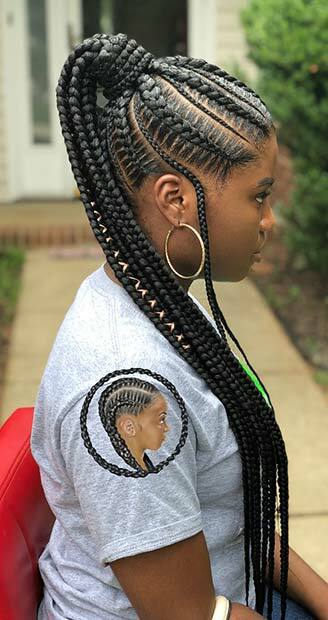 The hair has been braided into a center braid with braid cuffs and also has side braids that start thin and follow round the head into the ponytail. Recreate a similar look or choose different patterns and braid thicknesses. Our next idea features another intricate design. This one uses very thick braids and very thin ones too. 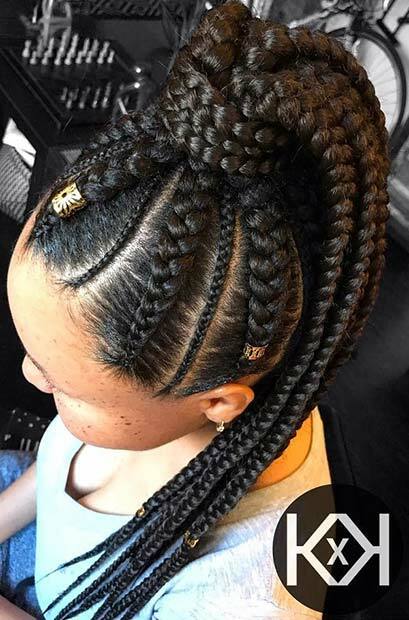 These braids follow a round shape until they blend into the ponytail. The hair also has this patterned design on the back of the head too. This is such a trendy hairstyle and it will suit anyone. Next, we have a chunky braided ponytail to share with you. We love this one because of the chic braid cuffs. The braid cuffs jazz up the ponytail and give it a super stylish look. 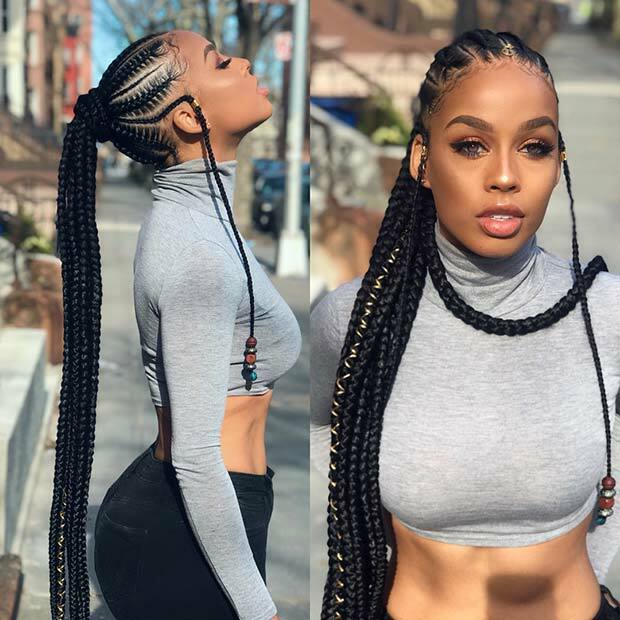 Recreate this ponytail or use just thick braids instead of a mix. Looking for a unique ponytail idea? Then this next pick is for you. 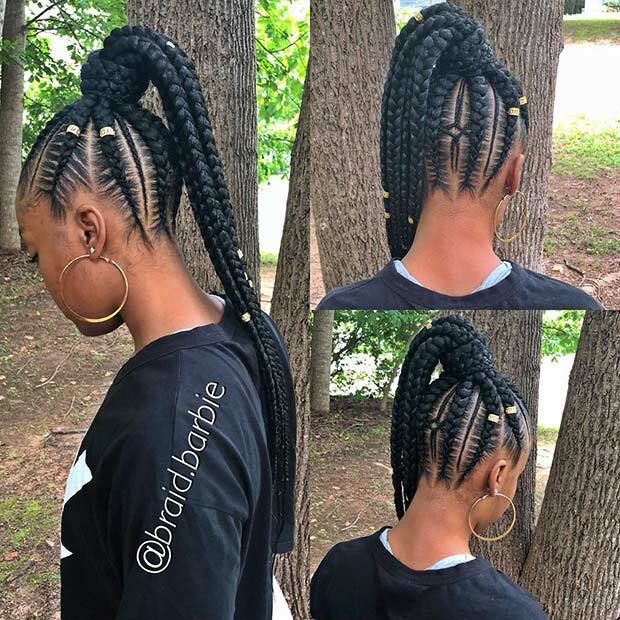 The hair has been braided into twists with braid cuffs and it also has braids that are styled into a wavy design. 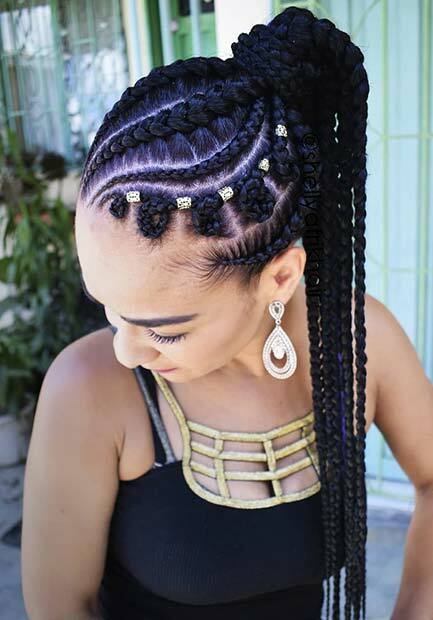 The braided twists create a circular pattern which is creative and statement making. Recreate the twists with wavy braids like featured or straight braids. Our next braided ponytail features a trendy mix of thin and thick braids. 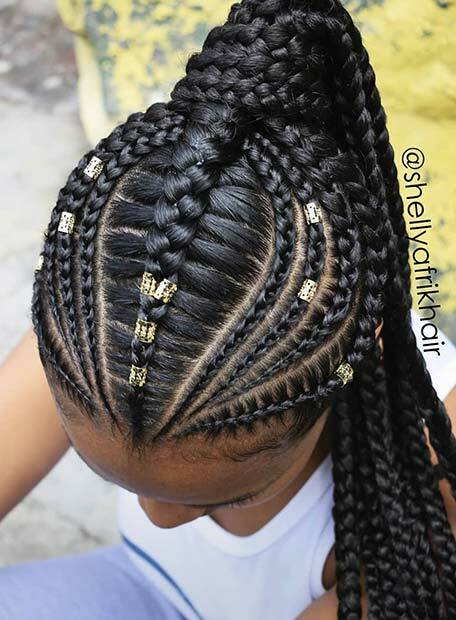 There are thin braids in-between the thick ones, and there is a stylish set of thin braids at the back of the hair. We love the thin braided section because it is very chic and unique. If you love the long ponytails, then you may like our next hairstyle idea. This ponytail is super long and is styled with medium thickness braids. 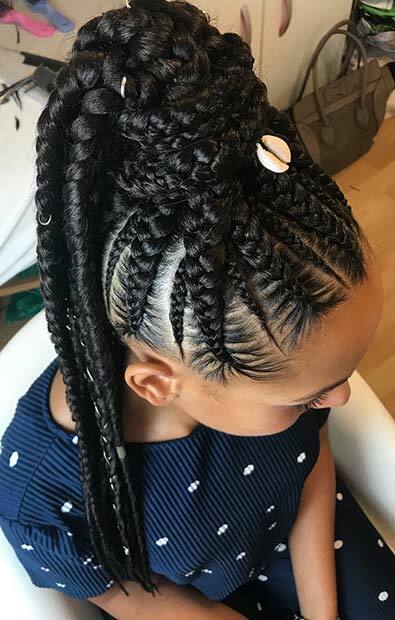 There is also loose braids at the sides and the look is completed with cords and beads. One of our favorite features is the very thin center braid with the braid rings. This is the perfect ponytail for a stylish queen! Next, we have a thin and thick braid ponytail with subtle blonde running through it. This is a beautiful ponytail idea. 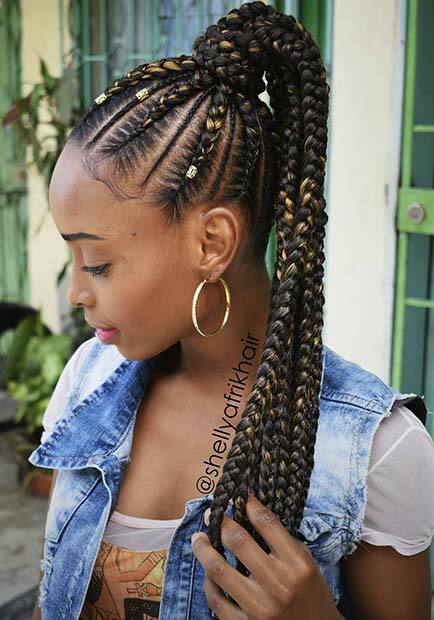 Recreate the blonde look or maybe try the braids with different colors. Red would be a great choice, if you want to be bolder, consider blue or purple. Last on our list is this long wrap around ponytail. 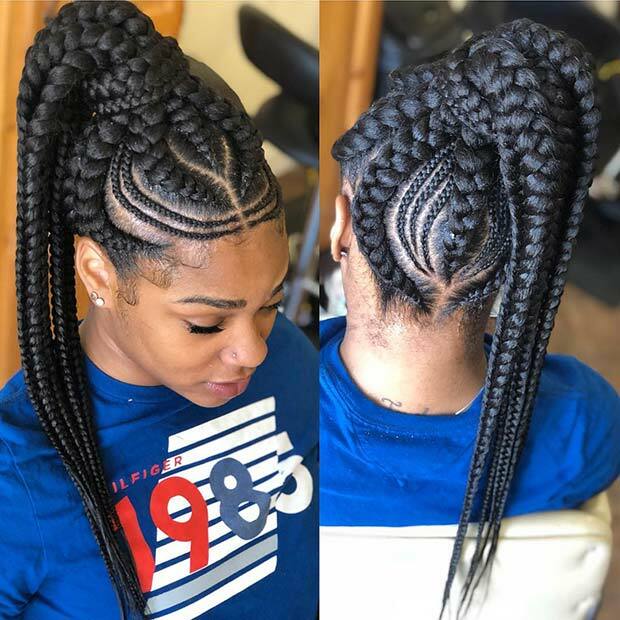 For this style the hair has been braided with thin and thick braids and the thin ones start in the opposite direction. The braids have also been wrapped around the start of the ponytail which gives it a trendy look. Recreate with or without the cords. 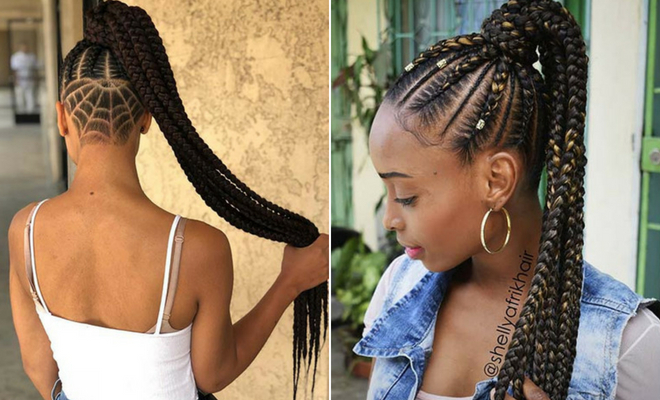 We hope you have found you next braided ponytail hairstyle!